The year of 2018 will let the world feel the potential of blockchain that had been hidden. Without a doubt, the year of 2017 was the year of cryptocurrencies that promised mountains and marvels. Millions of investors throughout the globe lost gigantic amounts in that brand-new assets. Most of them were amateur with poor experience or no knowledge of blockchain — the technology that created a new class of virtual currencies. According to experts, this community lacks the realization and motivation to start changing. Smart contracts can be used for centuries, can’t they? Among all blockchain-based technologies, the leader is not cryptocurrencies but decentralized smart contracts that automatically perform a certain function triggered by fulfillment of the prescribed conditions. What does it mean practically? Most industries have already been using smart contracts or plan to start soon. ConnectJob and Gibraltarbased are blueprinting using blockchain to develop economics and construction, grounding on the existing centralized app that will be deployed in several cities around the world. They want to be like Uber. This means that if you search for a masseur, you will find one. If you look for a babysitter, you will find one. If you want an accountant or someone to trim your lawn, you will easily find them using geolocation. We are a blockchain enterprise, and we understand that cryptocurrencies today are not what blockchain was created for. Our principle is simple: I earn one dollar today and I’m the only person who decides how to spend it. I cannot pay anyone for saving my money, nor return them or give them to anybody. Some 2.9M people have no access to the bank system, and banks cannot provide them with a good future. So, it is their own bank that ensures their prosperity. There are also some other apps that can perform similar functions. In UAE, enterprises (particularly, startups) more and more often go for smart contracts to facilitate operational efficiency. 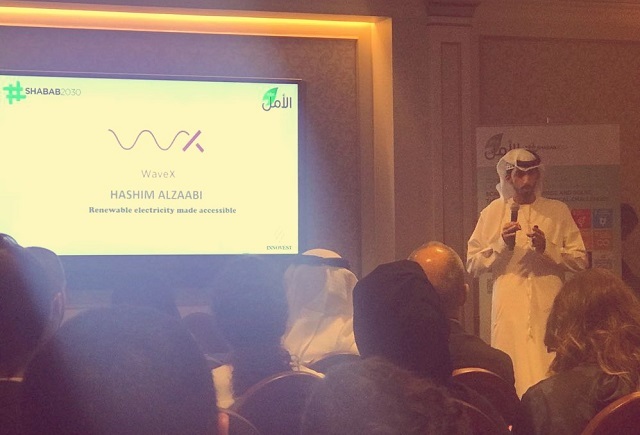 WaveX, a financial platform with the renewable energy supply and peer-to-peer solar panel, was launched in UAE in October 2017. The platform was the first local company that accepted smart contracts and the first ArabianChain’s blockchain-based startup from UAE. With the rapid evolution of the area, numerous forward-thinking startups and established enterprises in the region are already exploring the potential of blockchain. They do this not only to expand their capabilities but to make transaction processing and data exchange more efficient, reliable, and secure. UAE is Middle East’s most innovative state, where people recognize blockchain as the tool to reduce the number of paper deals by 100 million every year.